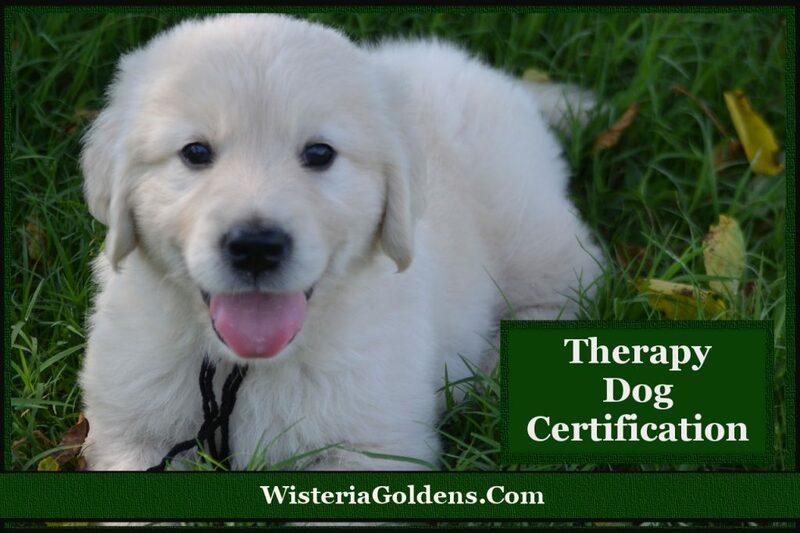 Some of our Wisteria Golden families have been interested in training their puppy to eventually become a therapy dog. This page discusses Qualifying for Therapy Dog Certification and where to find out more. The dog must pass a certification program in order to be allowed to visit hospitals, nursing homes, or other places where therapy dogs are needed. The first step in qualifying for this certification is for your puppy to pass a skills assessment test included in the therapy dog assessment administered by an authorized therapy dog organization. A list of authorized organizations is found on the AKC Therapy Dog Program page. Provide verification that your dog has been Certified/Registered with an AKC recognized therapy organization. 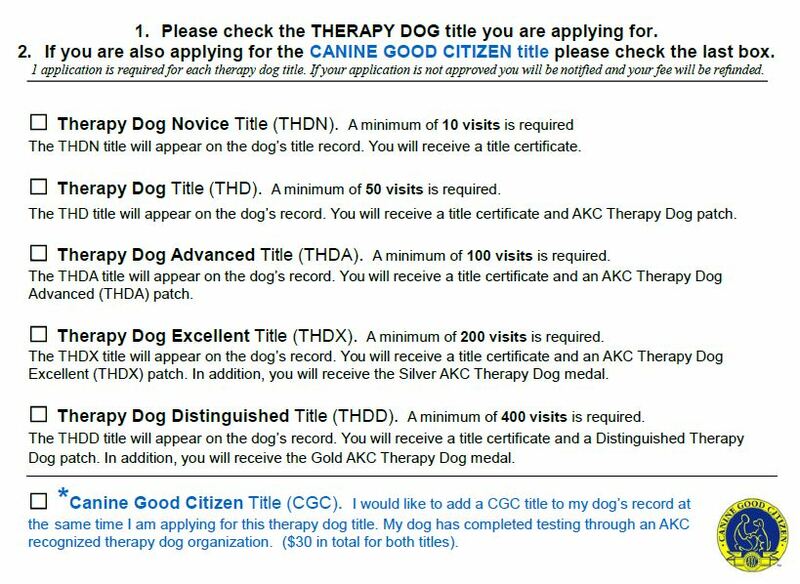 Select the Therapy Dog Title you would like to apply for (see list in the application excerpt below). Have your dog's AKC Registration Number (or PAL/CPN listing number) to provide on the application form. Perform the required number of visits for the title for which you are applying. Keep track your visits. The AKC has provided a sheet you can use to keep records of your visits Therapy Dog Record of Visits Sheet. “Therapy dogs are not service dogs. Service dogs are dogs who are specially trained to perform specific tasks to help a person who has a disability.” Each specialty (therapy or service) has specific requirements to qualify. “All dogs are eligible to earn AKC Therapy Dog titles, including purebreds and mixed breeds.” (see AKC.org for instructions regarding mixed breeds and purebreds who do not have registration). “These visits must be documented with time, date, location, and a signature of a staff person at the facility (e.g., school, hospital, etc. ).” Documentation must meet the requirements. Refer to the listed documentation options (see examples of how to calculate and how to keep recognized records of visits on AKC.org). When you decide to begin qualifying your dog to receive a Therapy Dog Title these are some skills he/she should have. Each of these may be included in the therapy dog assessment tests administered by an authorized therapy dog organization. Contact the organization you have chosen (based on the list at the bottom of the AKC Therapy Dog Program page) to ask for specific test preparation topics. Supervised Separation — Practice being around medical equipment, such as a wheelchair, crutches, cane, walker or other devices ordinarily found in a facility. In order to be a good therapy dog candidate, the dog must be able to work well around all types of people, including children. The dog will be observed for their reaction toward children playing, running or in the general presence at the testing site. Each visit will apply toward your Therapy Dog Certification and will need to be verified by the facility you visit. We would love to hear from our families that have achieved either of these rewards and showcase them on our website.